This online guide is an extensive look at the issue of drugs and children. 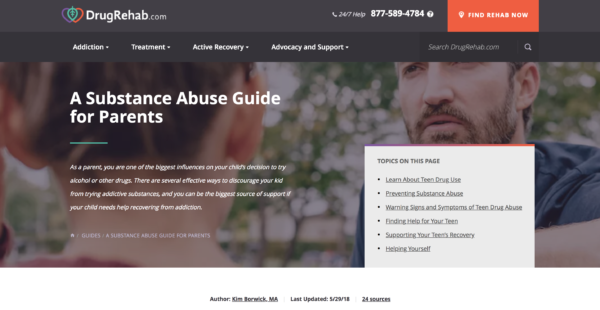 This fact-based, detailed and carefully researched (not to mention extensive) guide covers topics from drug usage statistics, drug dangers and access for teens.As part of a website “drugrehab.com” this guide is also concerned with treatment and follow-up for children to teens struggling with drug addiction or dependency. The guide also includes helpful tips for discussing drugs and substance abuse with children of different ages, from counseling suggestions to advice about paying for treatment. There’s a lot of good stuff here; definitely worth a bookmark! Perhaps primarily for parents of teens, this guide also covers topics and information that all parents should be aware of.